Big changes are coming to the Marvel Universe this May as Marvel unleashes Secret Wars unto the masses. Everything you know and love about your favorite characters is about to be turned on its head courtesy of writer Jonathan Hickman and artist Esad Ribic. Not only will the event have major ramifications in the Marvel Universe, but Marvel's entire publishing plans as well. We spoke to Marvel's SVP of Sales & Marketing, David Gabriel about what fans can expect and what to look forward to. 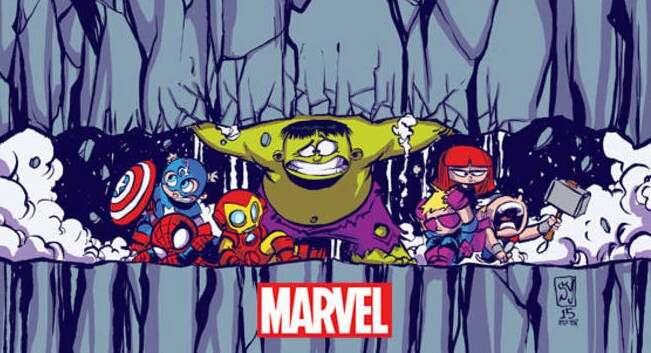 Not only that, but we have a ton of new art to show you, including new variant cover by Skottie Young. Before we dive deep into Secret Wars, I wanted to ask about books that will be ending during the event. There have been many new titles announced that will be happening during the event, but what are fans supposed to make of the "Everything Ends" teaser Marvel released? It means that there will be a “616 finale!” and that means exactly what many fans have suspected – everything ends. We’ve been saying it over and over again but at the core, Battleworld IS the Marvel Universe when Secret Wars #1 hits in May. But before that, there will be a number of titles reaching, what we’re calling, a “616 finale,” ending those stories and characters as you knew them – for now! Now in a perfect world, we’d have stopped every book with its April issue, putting out a nice clean May Previews catalog. Everyone would have seen upfront all those titles that had their finale, and all those titles that were starting fresh. But things don’t always go so easily. Instead we gave our creators the option to end their stories the way they wanted to; we let them tell "Last Days" stories if they wanted to; we let them tell Secret Wars stories if they wanted to. So in the end Secret Wars truly has been a creative driven process. Secret Wars is unlike any event ever published. It’s not just an event with a few tie-ins, it’s an entirely new publishing line, an entirely new television network’s fall line-up if you will. It’s not unlike what was done in the 1990s with Age of Apocalypse. Even then, that was just the X-Men titles. But this is so much more. The entire Marvel Universe will be affected in some really shocking, really surprising ways. And that’s just the beginning of the fun! On that note, there are also some titles that have just started, or yet to start. What about books like Spider-Gwen, and Howard the Duck. Will they live outside of what is happening during the event and catch up when it's over? Secret Wars will affect every title in some way shape or form so you can definitely expect Spider-Gwen, Howard the Duck, All-New Hawkeye and others to deal with it in their own ways. Like I mentioned before, none of our creators were blindsided by Secret Wars so they’ve all had plenty of time to work it to their advantage – catering to their own tastes and storytelling, using the event to add something new to the Marvel Universe that wasn’t there before. Of course, existing titles and franchises will also be affected – the Avengers, the X-Men, the Inhumans, the Fantastic Four, Spider-Man and the rest of the Marvel line. But some of those books had a little more time to get up to speed with what we had planned, so allowances needed to be made. Keep in mind that even though we all knew Secret Wars was on the horizon, we still needed to publish comics until then! Look at what we’ve been putting out there since October. From the new Thor, All-New Captain America, Superior Iron Man, Ant Man, Squirrel Girl, Silk, Spider-Gwen, Howard the Duck and on up through Uncanny Inhumans, it’s pretty clear that we’ve continued month after month to excite the industry with new ideas, new concepts, new characters! We’ve had a plan for each and every title in our line, from the All-New Ghost Riders to the Spider-Gwens and Howard the Ducks and even throughout our core titles. Some may take a hiatus for a month or two (something the industry is accustomed to); some will reach their “616 finale;” some become Battleworld transformed; and still others…well we’ll get to those! There are a few different banners that these Secret Wars books are carrying. Between Battleworld, Last Days & Warzones!, how did you decide which book got what banner? It came out of a desire to make it as easy as possible for fans and retailers to digest. Axel [Alonso] sat with creators and editors last year and asked them all what kinds of stories they wanted to tell. In talking to Jonathan [Hickman] about the nuts and bolts of Secret Wars and with the individual teams on how their stories fit in – we carefully crafted those three different banners of titles. -LAST DAYS titles are creators bringing their stories to their natural conclusions before the destruction of the Marvel Universe. What would you do if you knew it was your last day on Earth? What would your favorite Marvel characters do? Bringing it back to the television analogy, these would be the newscasts! -BATTLEWORLD titles are almost like our regular monthly titles. The core continuity. These books are what’s happening in the Secret Wars Universe and the continuity of Battleworld. How do these territories all co-exist? How do they work? These books will tell you all you need to know about what’s happening during the event. In the TV season analogy, these would be the primetime shows. -WARZONES! are the building blocks of the Marvel Universe, event level stories all on their own. While these are mostly self-contained, they’re also grand pieces of continuity from Marvel’s past and new spins on existing favorites. All of which are laying foundations for a new Marvel Universe. Each of these stories can be read on their own, but you can bet that each of these titles is going to have a big effect on the future of the Marvel Universe post-Secret Wars. Finally in the TV season analogy the Warzones! titles would be the Oscars, Grammys, Super Bowl, and the Saturday Night Live 40th anniversary special rolled into one! Another short and easy way to remember that: LAST DAYS are the Past, BATTLEWORLD is the present, and WARZONES! are the future. Also, it's been noted in the press releases for these announcements that they're a Secret Wars "series" and not a "tie-in." Can you explain the difference? To us, the term “tie-in” has such a narrow scope in terms of ONLY relating to one central story. That term doesn’t really describe these. Secret Wars series are the Marvel Universe series throughout the time it takes us to tell Secret Wars. For example, during Secret Wars Amazing Spider-Man: Renew Your Vows is the “core” Spider-Man series. That should be pretty obvious considering Dan Slott is writing it. Dan’s current Amazing Spider-Man title isn’t a “Marvel Universe Tie-In”, just like Renew Your Vows isn’t a “Secret Wars tie-in”. Some folks have asked us to define a Secret Wars series, and that’s simple. A Secret Wars series exists while Battleworld exists. And every story told on Battleworld is going to provide clues to the future of the Marvel Universe. Looking at Secret Wars as a larger publishing plan, comic fans will definitely see similarities between this event and like you mentioned earlier, Age of Apocalypse. Given what came at the end of AoA, can fans expect something similar for Secret Wars? Remember, at the time Age of Apocalypse was one of the most unique story/sales marketing programs ever attempted in comics. I think we can all agree 20 years later it was a rousing success still talked about today. Age of Apocalypse left a long shadow on the X-Men franchise for many years and effects from that story are still in play. You can expect Secret Wars to behave the same way, only amplified exponentially. Axel Alonso and Tom Brevoort have been working very closely with the individual creative teams to ensure that each and every title is additive to the Marvel Universe. New characters, new locations, new villains and so much more are going to be born in these pages. And you can bet you’re going to see those reflected post-Secret Wars. DON’T miss the All-New, All-Different Avengers Free Comic Book Day issue. It’s your first glimpse into what’s to come. What has the retailer response been to the event? Great! We’re going to surpass a half a million units on the first issue which is amazing. And that’s just selling straight to our Direct Market core retailers. We’ve had an extremely successful year in bringing in new fans and retail partners but I’m extremely proud to bring such a big number to local comic shops. Our marketing team deserves a ton of credit, but it’s also a testament to the strong titles the editors and creators put together. Also we have nearly tripled the amount of retailers who are involved in the Secret Wars launch parties as opposed to those who normally participate. All in all, they’re just as excited about it as we are. Retailers and fans have been with us since we announced Secret Wars on a cold night back in October. It’s been a crazy ride so far, and we’ve had every indication that they’re sticking around for more. We think everyone realizes that the future of the Marvel Universe is beginning here and the entire comics industry is looking to see what we do next! Retailers know that means more fans in their stores and more money in their pockets. We’re thrilled they’re on board with this entire initiative. So there you have it ComicBook.com readers! Are you excited for what Marvel has planned this Summer? Let us know below!